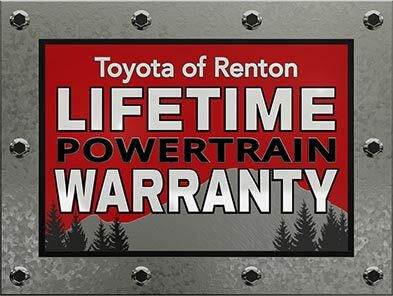 Receive our Lifetime Powertrain Warranty! Not all Toyota Dealers are the same! Q: What’s covered under the warranty? Gasoline/Diesel Engine: all internal lubricated parts - engine block - cylinder head(s) - exhaust manifold - expansion plugs harmonic balancer - intake manifold - mounts - oil pan (excluding drain plug related failures) rotary engine rotor housing - timing belt/chain and tensioner - timing chain cover - valve cover(s) -water pump - electric coolant pump - electric oil pump -diesel accessory vacuum pump, lift pump, injectors and injector pump - manufacturer-installed turbocharger(s), bypass valve(s), blow-off valve(s), intercooler and waste gate(s) -manufacturer installed supercharger. Transmission (Automatic, Continuous Variable (CVT), Standard and Transfer Case): all internal/internally lubricated parts - metal cooler lines - mounts -throttle valve cable - torque convertor- flywheel/flexplate - transmission and transfer case housing - transmission cooler - oil pan - vacuum modulator - external and internal control unit - automatic electronic clutches. Drive Axle (Front/Rear/AWD/4 Wheel Drive): all internal lubricated parts within the drive/transaxle assembly and housing, including axles and axle bearings - constant velocity joints - drive shaft support - differential cover - hub bearings - front hub locking assemblies - drive shaft - universal joints - four-wheel drive actuator. Filters, Fluids, Lubricants and Taxes: filters, fluids, lubricants and taxes required to complete a Covered Repair for any Covered Part listed above. Seals and Gaskets: Seals and gaskets for all Covered Parts listed above when subject to a Covered Repair. Q: What does Lifetime entail? Q: Where can I get repairs done? A: We will either provide the Repairs ourselves or reimburse an authorized licensed repair facility to do so. In circumstances where we are not performing the Repairs, we will not pay for expenses that exceed the manufacturer’s suggested retail price or the posted hourly labor rate for the repair facility multiplied by the appropriate operation time, as published in a nationally-recognized labor time guide. You will be responsible for paying any excess costs charged by the repair facility. We will not reimburse you or a repair facility to the extent a Mechanical Breakdown is also covered by the manufacturer’s warranty, regardless of whether the manufacturer honors its coverage obligation. Q: Who Should I call for Authorization to use a different repair facility? A: Call the Administrator at 1-800-222-2721 to obtain authorization. Q: If my vehicle needs repairs, do I get reimbursed for a rental car? Q: How do I get reimbursed for a rental vehicle? A: Call 1-800-222-2721 to request reimbursement. Q: Is this warranty Transferrable to another person should I sell them by vehicle? A: No. This Warranty may not be transferred or reassigned. Please see Warranties Exclusions and Other Coverage Limitations for details on what’s not covered under this Warranty.